The R27 represents an aggressive evolution of the design philosophy that has won world championships for Renault in 2005 and 2006. Stable chassis regulations meant performance gains were becoming increasingly difficult to find, and more radical solutions – such as the sidepod treatment of the R27 – were required. The R27 features an instantaneous gearchange (IGC) gearbox for the first time. This technology has already been run by other teams, but will make its track debut in Melbourne. The unit has already completed thousands of kilometres of reliability running in a hybrid car, with promising results. 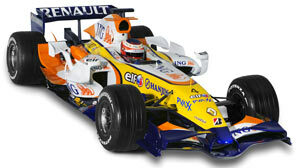 The R27 is first Renault F1 car to run on Bridgestone tyres. With the same specification of tyre available to all competitors, the onus is on the teams to exploit the tyres in the most effective manner possible. With this in mind, the R27 has been designed to be more adjustable in terms of weight distribution and other dynamic characteristics, in order to provide the trackside engineering teams with maximum flexibility in tuning the car. While chassis regulations were stable, the engine regulations were changed heavily to reduce performance. Hence the RS27 is a modified version of the RS26 V8 engine that completed the 2006 Chinese and Japanese Grands Prix in Fernando Alonso’s car. All modifications to the engine in order to optimise the engine’s performance for the maximum rev limit of 19,000 rpm imposed by the regulations. Modifications were also permitted to engine installation on condition that these brought no direct performance benefit. Electronic systems: Integrated Step 11 chassis/engine electronics and software co-developed by Renault F1 Team and Magneti Marelli. Transmission: Seven-speed semi-automatic titanium gearbox with one reverse gear.